Unlike the two classics I just mentioned, Ketan Joshi’s Three Amigos Ride to Ladakhmade me feel at home. There were pilgrims marring the scenic beauty, the indecisive and adamant officer at a border check post, tourists polluting mountain lakes, the lazy and incompetent goods clerk, and not to mention the police trying to find an excuse to extort money – all these make us Indians feel very much at home. Then comes the most important part: the destination is Ladakh. I downloaded Dipy Singh Private Detective by Ketan Joshi only this morning. By evening I finished the book and decided to write a review – partly because I like Ketan Joshi’s writings and partly because I think I should point out a few things that if the author does care for my humble opinions, could help him improve his writings. This is the second book by Ketan Joshi that I picked up this year. 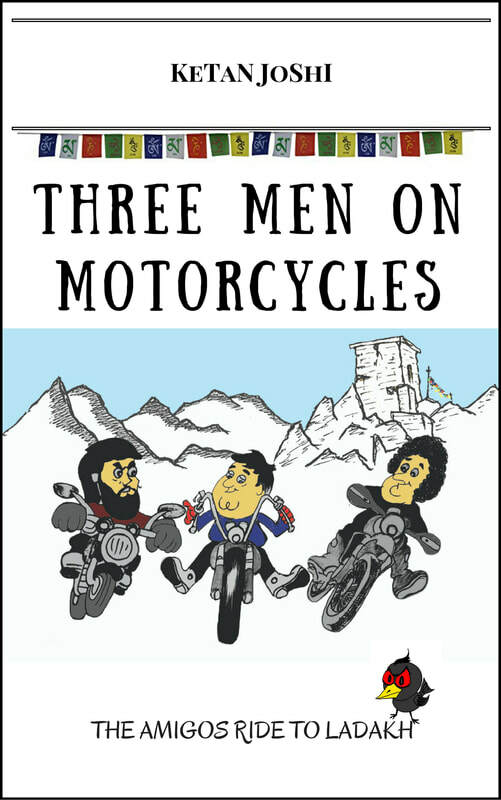 The earlier one Three Amigos on Motorcycles was a pretty impressive work of literature. In fact if you have already finished his Dipy Singh series, you will definitely see the big leap his writing has taken in Three Amigos. If you reverse the order then there is a possibility that you may judge the author harshly. The first thing you notice in Ketan Joshi’s writings is his remarkable grip over language. He knows how and when to create humour. Now that quality alone will make you fall in love with him. Humour – the carefree and extravagant sort of fun – that you find in his writings is rare. We come accross dark humours, satires, sarcasms everywhere – and that seems to be normal considering all sorts of unfortunate things we had to deal with in last decade. Literature of our times mirrors everything perfectly without bothering to know how much we are capable to face. This journalistic matter-of-fact way of telling stories deprives literature of much of its charm. Just when you are about to lose all hope, writers like Ketan Joshi arrives with their utterly ridiculous, dumb-and-dumber kind of original fun. It brightens you up, makes you giggle like crazy. Can one help but adore such writers? The Adventures of Dipy Singh Private Detective, however hides most of Ketan Joshi’s art. While reading it I found out a few lines, paragraphs, that if were written otherwise could substantially improve the stories. This I am going to discuss now. But first let me tell you what this book is about. Deepinder Singh Gehlot or in short, Dipy Singh is a private detective. The writer made Dipy’s acquaintance at a party and became friends. The Adventure of Dipy Singh Private Detective is a collection of short stories. They are cases solved by Dipy. He loves Tandoori with beer. On what grounds? If he goes to the courts or to the press, the local corporator ... or anybody at all, I will be permanently disgraced s a complete nutcase. The two answers somehow don’t go together well. The inherent fallacy has the risk of being interpreted as a badly finished plot. In the case of the Tantric dreams, though the culprit was caught, several things remained unexplained or explained half-heartedly. And we were even more startled when an answer came ... from the goat! How the dead goat spoke up, that too in human voice and vernacular was never explained. Simply saying something was ingenious isn’t the same as explaining it. In Three Amigos Ketan Joshi was remarkably discreet in character formation. But then the three friends there and the wife were all important characters. I think in Dipy Singh he was less focused on the minor characters. There was nothing distinguishing in their speeches. They all sound the same. For example, in The case of the Uncatchable Thief, two different characters described two different safes, placed in two different locations by using the same phrase – the Huge Bloody Thing. The author has to work on these things. The scene that flashed over my eyes had me doubling over with laughter. The sigh of me laughing, and the memory of that day got Dipy laughing too, and for the next few minutes we laughed until I got a stitch in my side. Fine. But my sufferings became unbearable when after the thief teleported back to his house, Dipy Singh who was already present there made him a cup of tea. After he had calmed down, we chatted about his gift of teleportation that I found very interesting. So instead of jumping and shouting “Eureka” at the top of his lungs, Dipy Singh decided the chat because he found the phenomenon of teleportation interesting. And the thief gave up his life of crime and started a business of Instant Courier. And that left me completely shattered. The book cover of The Adventure of Dipy Singh Private Detective gives you the impression that its an utterly meaningless, ridiculous comedy. In fact, the book could very well be so. But the seriousness with which each case starts added to the megalomania of Dipy Singh made the stories a breed between Sherlock Holmes andThe DefectiveDetective by Stephen Leacock. It is a thoroughly enjoyable book and fun to read. "The cases are interesting and this kept me glued to the book. The language is simple and the author’s style of writing them as a part of his conversation with Dipy Singh is a nice idea. I read one story at a time and enjoyed them all. And the best part of the book is that I can give it to my kids to read, and also to my parents as I know it is a book meant for all age groups. Personally for me, I loved the case of the fat man."